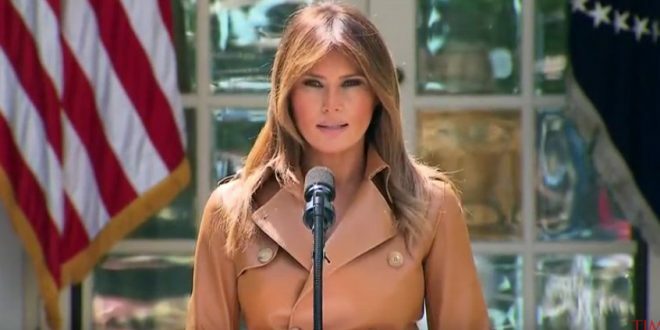 REPORT: Trump Tried To Quash The #BeBest Campaign - Joe.My.God. The president suggested that Mrs. Trump choose a different topic to avoid questions about how the wife of a notorious Twitter bully could lead a campaign to spotlight anti-bullying and other child wellness efforts, and he warned her that she was opening herself to such jeers, people familiar with the conversations said. She rejected his advice, and publicly said she was willing to face the criticism. Despite a tightly controlled rollout and assurance from her aides ahead of the event, one White House official said, Mrs. Trump was still upset by accusations of plagiarism surrounding the launch of the initiative, and was frustrated by the president not backing her up, in public or in private. Mrs. Trump, a former fashion model who prefers clean, modern lines, had chosen some furniture for the White House residence in the months before she joined her husband in Washington. Yet in her absence, President Trump — whose tastes veer toward the gilded, triumphal style of Louis XIV — replaced her choices with several pieces he liked better. One of two people familiar with the episode cited it as an example of Mr. Trump’s tendency not to relent on even the smallest requests from his wife. The profile also notes that the Trumps maintain separate bedrooms in the White House and stay in separate hotel suites when they travel.